International and interdisciplinary: A team for luminous nanosensors	Focus on research: "QuantumFrontiers"
Dr. Wasisto, you are from Indonesia, earned your bachelor’s degree there and your master’s degree in Taiwan. How did you come to join this team here in Braunschweig? In a rather roundabout way (laughs). I always had this dream of doing research in Europe. Germany was my first choice, mainly because it is very strong in technology. In Taiwan, I researched silicon technologies with the aid of an industry grant, and was able to earn my doctorate here in Braunschweig at the Institute of Seminconductor Technology under Professors Erwin Peiner and Andreas Waag. Right after that, I received a job offer from Georgia Tech (Georgia Institute of Technology) in Atlanta. So I basically dropped everything here and went to the US, but only for a little under a year. 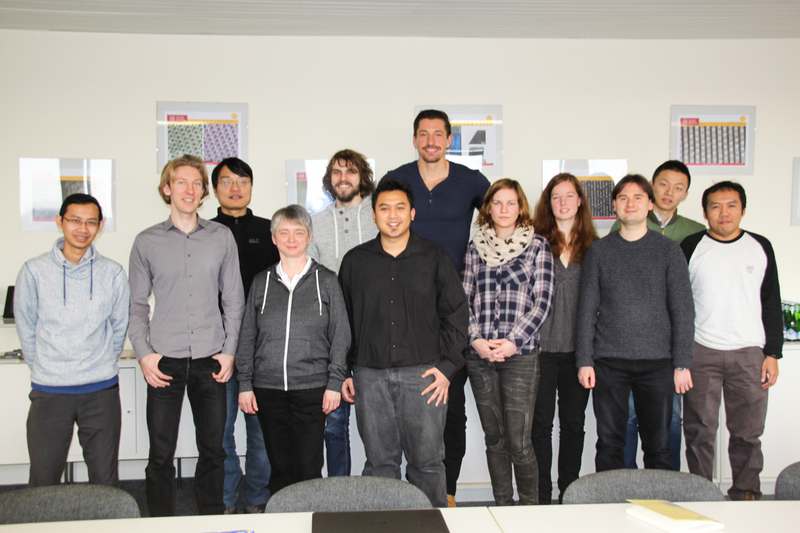 When I was given the chance to head this junior research group, I was delighted to come back to Braunschweig. Your team is made up of physicists, electrical engineers and chemists. Doesn’t this lead to “cultural” problems? Wasisto: Well, of course engineers and physicists have completely different work methods. Physicists want to understand the basics first, and then ask themselves which approach is the most promising. Engineers start by assembling something and then look to see if it works afterwards. But they also use knowledge taken from basic physics research and run simulations in order to make predictions. So we are learning a lot from each other. Scholz: Besides, we are already used to each other (grins). Here at TU Braunschweig, electronic engineering and physics belong to the same department. During our master’s degree programme, many of us chose Nanosystems Engineering (NSE) as a specialisation. This incorporates electrical engineering, physics, chemistry and biology. It’s all about working across intersecting disciplines. Wasisto: And our research is very application-oriented. We have many government-funded projects with partners from industry. Strempel: That’s why I joined this working group: I wanted to do application-oriented work even though, as a physicist, I am mostly focussed on getting to the bottom of mechanisms and understanding them. Granz: As a scientific engineer, I see myself at the crossroads between fundamental research and economic applications. Every day, we try to turn our natural scientists’ complex findings into practical applications for society. To do that, we have to work very closely together. You are working with gallium nitride. Most people are probably unfamiliar with that material. What is so attractive about it? Wasisto: You could say the semiconductor gallium nitride is the new silicon. By now, we have a very good understanding of silicon and have more or less fully exploited it from a scientific point of view. With gallium nitride, whole new avenues are opening up. For example, it could make electronic components even more powerful. In our working group OptoSense, we plan to develop new platforms for sensors using this material, which may in the future be used in biomedicine and to measure pollutants. We are working on the electronics, optical components, energy recovery and energy supply. And we don’t want to measure any which way, but rather selectively and very accurately. That is why we are cooperating closely with the German National Metrology Institute (PTB). Strempel: At this point, researchers all over the world are working with gallium nitride. The community is already quite vast. The boom began in the 1990s, when the first blue light-emitting diode (LED) was made from the material. In 2014, the Nobel Prize for physics was awarded for this. Scholz: Exactly. Before that, there were only the red and green LEDs that we remember from the electronic assembly kits we had as kids. It was only with the advent of blue LEDs made of gallium nitride that we were able to mix white light. This was a major breakthrough. 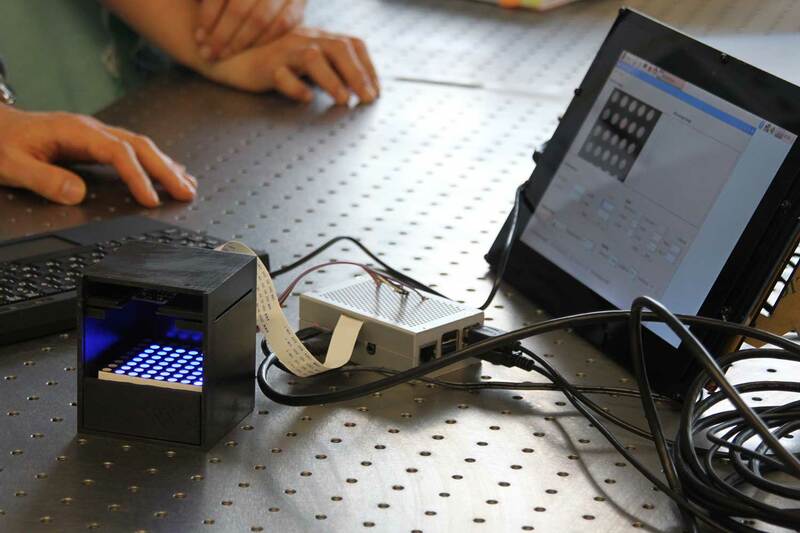 Since then, there have been countless new applications in lighting technologies and consumer electronics, but also in science, for example in lasers. Granz: But we want to take it a step further, because gallium nitride also has excellent electrical properties. As an example, all the electronics (such as transistors) surrounding a sensor could be made of gallium nitride instead of silicon. Zinc oxide, which is currently the most widely-used sensor material, could be replaced by gallium nitride. It is therefore conceivable that entire sensor systems could be made solely of gallium nitride, which would be a tremendous help in further miniaturisation. What role does your group play in the gallium nitride community? Wasisto: We are one of leading groups worldwide. Especially because we do not use the semiconductor two-dimensionally, but rather three-dimensionally, for example as nano wires or nano fins. This opens up entirely new possibilities. The only direct competitor in the field of 3D gallium nitride high-performance electronics is a team at MIT, the Massachusetts Institute of Technology, in the US. Whenever we are at a conference, like we were a few months back in Orlando and San Francisco, and MIT researchers give presentations, we always ask them a lot of critical questions (laughs). And vice versa, of course. How important are these international conferences? Wasisto: They are very important, especially if you want your research to be visible on an international level. Granz: Conferences are also important for finding out if the topic you are working on is even still relevant and of interest to the industry. Wasisto: Exactly. Just researching away, alone in your lab, is pointless. Nobody would know what we’re doing. That’s why publishing your work in renowned scientific journals is also very important. I once received a call from the industry about one of our projects. They were interested in patenting a technology. Without conferences and publications on the technology, that would never have happened. Granz: However, scientific writing is a skill that needs to be learned. In the beginning, you send a draft to your advisors, co-authors and reviewers, and when you get the text back, it is covered with red, full of corrections, questions and suggestions for improvement. You gradually get a feel for it, and it becomes much easier. Wasisto: That’s perfectly normal; it was the same for me at the start. You just have to keep working on it. It’s also very good preparation for your doctoral thesis. That’s when you really have to deal with such questions. And by then, you will have gained enough experience that you can answer them quite readily. I personally was actually quite relaxed during my thesis for just that reason. How international is the OptoSense team? Granz: At our last Christmas party, they showed a diagram where you could see that our group comprises roughly as many German scientists as scientists from Indonesia, Russia, Spain and China. We have become more and more international in recent years. That’s definitely good preparation for the global workplace. We are learning how people from other parts of the world do scientific work, and what we need to pay attention to on a social level. Wasisto: For me, the connection to Indonesia is obviously very important. Many researchers like myself go to other countries to earn a doctorate or to work. Yet it would be preferable to keep well-educated engineers and scientists in the country. That’s why I initiated IG Nano, the Indonesian-German Centre for Nano and Quantum Technology. We support the scientists there and, with their help, advance our research here. It’s a true win-win situation. Ein Gespräch mit Dr. Hutomo Suryo Wasisto, Leiter der Nachwuchsgruppe OptoSense (Optochemical Integrated Nanosystems for Sensing) des Laboratory for Emerging Nanometrology (LENA), und seinen Doktoranden Tony Granz, Gregor Scholz und Klaas Strempel über kulturelle Vielfalt in der Wissenschaft, den Reiz von Galliumnitrid und warum sich gerade junge Forscherinnen und Forscher öfter mal aus dem Labor wagen sollten. Herr Dr. Wasisto, Sie kommen aus Indonesien, haben dort Ihren Bachelor- und in Taiwan Ihren Master-Abschluss gemacht. Wie sind Sie an diese Arbeitsgruppe in Braunschweig gekommen? Ein bisschen auf Umwegen (lacht). Ich hatte schon immer den Traum, in Europa zu forschen. Deutschland war meine erste Wahl, vor allem weil es technologisch sehr stark ist. Mit einem Industriestipendium habe ich in Taiwan an Siliziumtechnologien geforscht und durfte dann hier am Institut für Halbleitertechnik bei Professor Erwin Peiner und Professor Andreas Waag promovieren. Gleich danach kam allerdings ein Stellenangebot von der Georgia Tech (Georgia Institute of Technology) in Atlanta. Da habe ich hier sozusagen alles stehen und liegen gelassen und bin in die USA. Aber nur für fast ein Jahr, dann wurde mir die Leitung dieser Nachwuchsgruppe angeboten und ich kam sehr gerne zurück. In Ihrem Team arbeiten Physiker, Elektrotechniker und Chemiker zusammen. Gibt es da keine „kulturellen“ Probleme? Wasisto: Ingenieure und Physiker arbeiten natürlich ganz unterschiedlich. Physiker wollen die Grundlagen verstehen und überlegen dann, welche Vorgehensweise sinnvoll sein könnte. Ingenieure dagegen bauen erst mal etwas zusammen und gucken hinterher, ob es funktioniert. Allerdings nutzen sie dafür auch durchaus Erkenntnisse aus der physikalischen Grundlagenforschung und machen Simulationen, um Vorhersagen treffen zu können. Wir lernen also auch viel voneinander. Scholz: Außerdem sind wir schon aneinander gewöhnt (grinst). Elektrotechnik und Physik gehören zur gleichen Fakultät. Und viele von uns haben im Masterstudium das Vertiefungsfach „Nanosystems Engineering“ (NSE) gewählt. Da geht es um Elektrotechnik, Physik, Chemie und Biologie. Interdisziplinäres Arbeiten ist da sozusagen Programm. Wasisto: Und wir forschen insgesamt schon sehr anwendungsbezogen. Wir haben zum Beispiel viele staatlich geförderte Projekte mit Industriepartnern. Strempel: Genau deshalb bin ich auch in diese Arbeitsgruppe gekommen. Ich wollte etwas Anwendungsbezogenes machen, obwohl ich als Physiker tatsächlich vor allem daran interessiert bin, Mechanismen zu ergründen und zu verstehen. Granz: Ich sehe meine Position als wissenschaftlicher Ingenieur an der Schnittstelle zwischen der Grundlagenforschung und der wirtschaftlichen Anwendung. Wir versuchen jeden Tag, die komplexen Erkenntnisse unserer Naturwissenschaftler in praktikable Anwendungen für die Gesellschaft zu überführen. Dafür müssen wir eng zusammen arbeiten. Sie arbeiten mit Galliumnitrid. Das Material ist den meisten Menschen vermutlich kein Begriff. Was ist so reizvoll daran? Wasisto: Der Halbleiter Galliumitrid ist so etwas wie das neue Silizium. Silizium ist mittlerweile gut verstanden und wissenschaftlich praktisch ausgereizt. Mit Galliumnitrid öffnen sich sozusagen ganz neue Türen. Zum Beispiel können elektronische Bauteile noch leistungsstärker werden. In unserer Arbeitsgruppe OptoSense wollen wir mit dem Material neue Plattformen für Sensoren entwickeln, die in Zukunft zum Beispiel in der Biomedizin und für Schadstoffmessungen zum Einsatz kommen können. Wir arbeiten an der Elektronik, an optischen Komponenten, an Energierückgewinnung und Energieversorgung. Und wir wollen nicht nur irgendwie messen, sondern selektiv und hoch präzise. Deshalb arbeiten wir auch eng mit der PTB zusammen. Strempel: Mittlerweile arbeiten weltweit viele Forscher mit Galliumnitrid. Die Community ist schon ziemlich groß. Der Boom begann in den 1990ern, als aus dem Material die erste blaue Leuchtdiode (LED) hergestellt werden konnte. Dafür gab es 2014 auch den Nobelpreis für Physik. Scholz: Genau. Davor gab es nur die roten und grünen LEDs, wie man sie aus dem Elektronikbaukasten kennt. Erst mit den blauen Leuchtdioden aus Galliumnitrid konnte auch weißes Licht gemischt werden. Das war der Durchbruch. Dann gab es viele neue Anwendungen in der Beleuchtungstechnik und Unterhaltungselektronik, aber auch in der Wissenschaft, für Laser zum Beispiel. Granz: Wir wollen aber noch einen Schritt weiter gehen, denn Galliumnitrid hat auch hervorragende elektrische Eigenschaften. So könnte die ganze elektronische Umgebung eines Sensors, zum Beispiel Transistoren, statt aus Silizium aus Galliumnitrid gebaut werden. Auch das zurzeit gängige Sensormaterial Zinkoxid könnte durch Galliumnitrid ersetzt werden. Es wäre also denkbar, ganze Sensorsysteme allein auf Galliumnitrid aufzubauen, was vor allem bei der weiteren Miniaturisierung helfen würde. Welche Rolle spielt Ihre Gruppe in der Galliumnitrid-Community? Wasisto: Wir sind eine der führenden Gruppen weltweit. Besonders weil wir den Halbleiter nicht flächig einsetzen sondern vertikal, also dreidimensional, zum Beispiel als Nanodrähte oder Nanofinnen. Das eröffnet ganz neue Möglichkeiten. Der einzige direkte Konkurrent auf dem Gebiet der Galliumnitrid-3D-Leistungselektronik ist ein Team am MIT, also am Massachusetts Institute of Technology, in den USA. Wenn wir auf einer Konferenz sind, wie zum Beispiel vor ein paar Monaten in Orlando und San Francisco, und die MIT-Forscher halten Vorträge, fragen wir immer sehr kritisch nach (lacht). Umgekehrt aber natürlich auch. Wie wichtig sind solche internationale Konferenzen? Wasisto: Sehr wichtig, allein schon um mit der eigenen Forschung international sichtbar zu werden. Granz: Die Konferenzen sind aber auch wichtig, um herauszufinden, ob das, was man macht, überhaupt noch relevant und ob es für die Industrie interessant ist. Wasisto: Ja, nur im Labor vor sich hin zu forschen, das bringt nichts. Dann weiß niemand, was wir tun. Auch das Publizieren in renommierten Fachblättern ist deshalb sehr wichtig. Zum Beispiel habe ich einmal einen Anruf aus der Industrie wegen eines unserer Projekte bekommen. Die hatten Interesse an einer patentierten Technologie. Ohne Tagungen und Veröffentlichungen dazu hätte es diese Anfrage vermutlich nie gegeben. Granz: Allerdings will das wissenschaftliche Schreiben auch erst mal gelernt sein. Am Anfang schickt man einen Entwurf an den Betreuer, an die Co-Autoren und Gutachter und dann kommt der Text komplett rot zurück, voll mit Korrekturen, Fragen, Verbesserungsvorschlägen. Mit der Zeit bekommt man aber ein Gefühl dafür und es geht leichter von der Hand. Wasisto: Das ist ganz normal, das ging mir damals auch so. Da darf man einfach nicht aufgeben. Aber es ist auch eine sehr gute Vorbereitung für die Promotion. Spätestens dann muss man sich ja solchen Fragen stellen. Und dann sind sie nur noch so etwas wie Frequently Asked Questions, FAQs, die man leicht beantworten kann. Ich jedenfalls war bei meiner Promotion aus genau diesem Grund ziemlich entspannt. Wie international ist das OptoSense-Team? Granz: Auf unserer letzten Weihnachtsfeier wurde ein Diagramm gezeigt. Da konnte man sehen, dass in unserer Gruppe ungefähr genauso viele Deutsche arbeiten wie Menschen aus Indonesien, Russland, Spanien oder China. Wir sind in den letzten Jahren immer internationaler geworden. Und das ist auf jeden Fall eine gute Vorbereitung auf die globale Arbeitswelt. Denn wir lernen schon jetzt, wie Menschen aus anderen Ländern wissenschaftlich arbeiten und was man im sozialen Bereich beachten muss. Wasisto: Mir persönlich ist natürlich die Verbindung zu Indonesien besonders wichtig. Viele Forscher gehen wie ich in andere Länder, um dort zu promovieren oder zu arbeiten. Dabei wäre es auch wünschenswert, gut ausgebildete Ingenieure und Wissenschaftler im Land zu halten. Deshalb habe ich das IG-Nano ins Leben gerufen, das Deutsch-Indonesische Zentrum für Nano- und Quantentechnologie. Wir unterstützen die Wissenschaftler dort, können aber mit ihrer Hilfe auch unsere Forschung voranbringen. Das ist eine echte Win-Win-Situation. 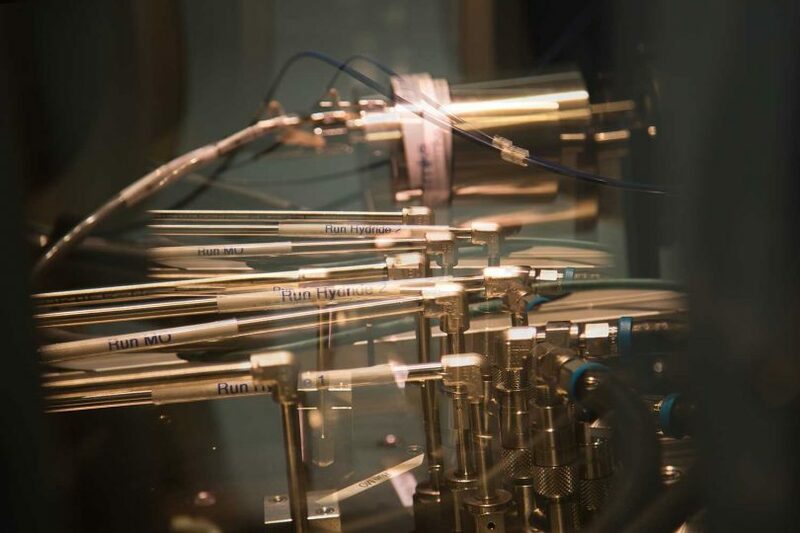 With the research alliance of TU-Braunschweig and Leibniz Universität Hannover researchers of both Universities intensified their cooperation in the strategic research area QUANOMET – Quantum- and Nanometrology. In close collaboration with Physikalisch-Technische Bundesanstalt PTB Braunschweig, this resulted in the joint excellence cluster proposal QuantumFrontiers – Light and Matter at the Quantum Frontier: Foundations and Applications in Metrology, which has recently been elected for the final round of the German excellence initiative research funding program. QuantumFrontiers is devoted to foundations of quantum- and nano-metrological phenomena using quantum techniques, enabling precision at the frontiers of measurability. In an interdisciplinary network of physicists, natural scientists and engineers, physical concepts for tomorrow’s metrology will be developed and implemented to make new technologies available, thus opening new metrology windows into the world of the smallest and the largest. Mit der Wissenschaftsallianz der TU-Braunschweig und der Leibniz Universität Hannover haben Forscher beider Universitäten ihre Zusammenarbeit im strategischen Feld QUANOMENT – Quanten- und Nanometrologie verstärkt. In enger Kooperation mit der Physikalisch-Technischen Bundesanstalt PTB Braunschweig resultierte daraus der gemeinsame Exzellenz-Cluster Antrag QuantumFrontiers – Licht und Materie an der Quantengrenze: Grundlagen und Anwendungen in der Metrologie, der kürzlich in die Endrunde für die deutsche Exzellenzstrategie Forschungsförderung gewählt wurde. QuantumFrontiers widmet sich den Grundlagen quanten- und nanometrologischer Phänomene um durch Quantentechnologien Präzision an den Grenzen der Messbarkeit zu erreichen. In einem interdisziplinären Netzwerk aus Physikern, Naturwissenschaftlern und Ingenieuren sollen die physikalischen Konzepte für die Metrologie von morgen entwickelt und angewendet werden um neue Technologien verfügbar zu machen und dadurch neue Fenster der Metrologie in die Welt des Kleinsten und Größten zu öffnen.